I'd like to put our arseniclife submission to Science onto the arXiv server so that anyone who's interested can read it. Not many biologists use arXiv (it's mainly a physics thing) but it's a very convenient place to post manuscripts and other documents. And its use by physicists provides a great precedent for open science, because manuscripts are posted there and submitted for formal publication in peer-reviewed journals. Distribution on the Internet may be considered prior publication and may compromise the originality of the paper as a submission to Science. Please contact the editors with questions regarding allowable postings. Not sure about ArXiv & Science. But Nature Precedings might be a good place http://precedings.nature.com/ (Especially if you go with one of the Nature journals, of course). Check with the editors, and maybe with some physicists who published in Science. The use of ArXiv would be wonderful for biology. I would say that you run a risk of rejection as a result, but Nature Precedings is a pretty weak alternative. As a high schooler, I would read coverage of scientific papers and be unable to access them because I was unwilling to pay the insane ($35 for an article?) prices and was not connected to a well-funded institution. This business model of forcing the public to read half-witted, sensationalistic news coverage of research papers instead of the real deal continues today. That being said, it's your work and your reputation - the fact that you considered ArXiv publicly is a triumph, and perhaps biologists will switch to that in the future as physics and CS did. I appreciate the work you've done to replicate the experiments and I'll be happy to read it in any venue. tl;dr: I have no idea if they'll be annoyed, but what you're doing is a good thing for science. And Science. Thanks. After publication, authors may post the accepted version of the paper on the author's personal Web site. Science also provides an electronic reprint service in which one referrer link can be posted on a personal or institutional Web page, through which users can freely access the published paper on Science's Web site. For research papers created under grants for which the authors are required by their funding agencies to make their research results publicly available, Science allows posting of the accepted version of the paper to the funding body's archive or designated repository (such as PubMed Central) six months after publication, provided that a link to the final version published in Science is included. (Details on this can be found in the license agreement for authors.) Original research papers are freely accessible with registration on Science's Web site 12 months after publication." 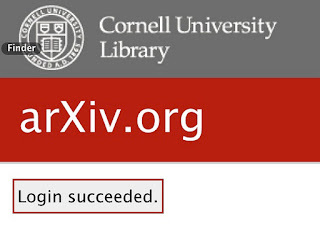 So much about Arxiv. Nature might be a better option, I've seen papers that at least appeared together at both places simultaneously. Twitter wasn't much help, but Carl is right. I got an email from the Science editor handling our manuscript saying that Science has no objection to arXiv posting of manuscripts. Nothing was said about not mentioning the submission. So the full manuscript is now available here. You may want to check also www.IntellectualArchive.com . It has options for biological e-prints and aslo distributes abstracts of works to libraries for free.